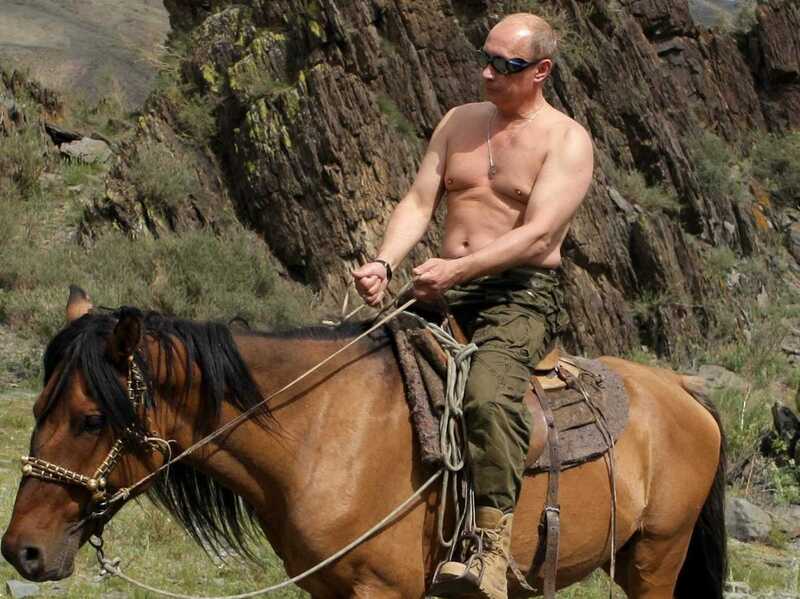 Sadly for the gaiety of the world, my musing last week that Putin was ill has turned out to be unfounded rubbish. I have been assured that all he had was a minor outbreak of botulism brought on by over-doing it with the Botox. Today, with said botulism and botox removed, he is back at work. Nice horse. I am glad that it lives. Who's the feller riding it? There was something in the Daily Jihad a bit back that he'd got himself an early 30's gymnast who looked remarkably like Miranda Sawyer - excuse, if any were needed, to pull a week or 2 sickie! Takes more than a pointy brolly to bring down old Vlad. Seriously. For the sake of national security it’s good to see he’s wearing the bullet proof shades. I had to google the name but I think that story was leaked by Miranda Sawyer. I think I’d rather spend 2 weeks with the horse. Googling 32 year old gymnast gave far better results. Seriously though he should be wearing a bullet proof vest. Preferably the under wired type that lifts and separates (for the older readers).